Spanning 1200 years of intellectual history – from the 6th century BCE emergence of philosophical enquiry in the Greek city-state of Miletus, to the 6th century CE closure of the Academy in Athens in 529 – Philosophy of Mind in Antiquity provides an outstanding survey of philosophy of mind of the period. It covers a crucial era for the history of philosophy of mind, examining the enduring and controversial arguments of Plato and Aristotle, in addition to the contribution of the Stoics and other key figures. 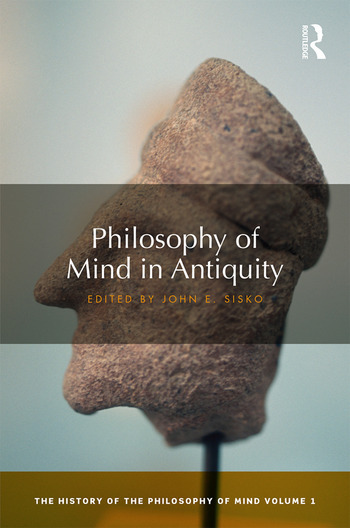 Essential reading for students and researchers in philosophy of mind, ancient philosophy, and the history of philosophy, Philosophy of Mind in Antiquity is also a valuable resource for those in related disciplines such as Classics. John E. Sisko is Professor of Philosophy and Dean of the College of Arts and Sciences at Queens University of Charlotte, USA. He has published in ancient philosophy of mind and physics, including papers in Ancient Philosophy, Apeiron, Archiv fur Geschichte der Philosophie, Classical Quarterly, Mind, Oxford Studies in Ancient Philosophy, and Phronesis.